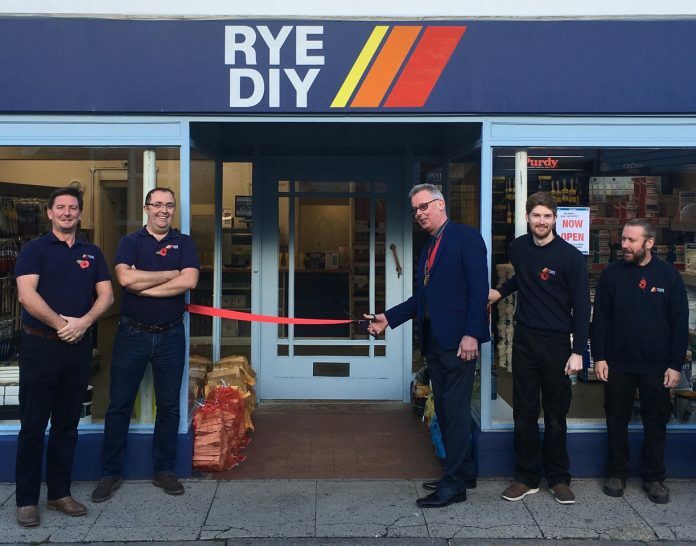 The Rye DIY shop in Cinque Ports Street was reopened for business on Monday October 19, by Rye Mayor, Cllr Michael Boyd. For 25 years there’s been a DIY store, known as Rye DIY, at this location. 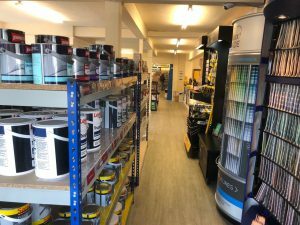 With the previous owners hanging up their aprons to enjoy (we hope) a long and healthy retirement, it seemed like a perfect evolution for Trade Paints, a family run independent decorators’ merchant with it’s headquarters in St Leonards. Trade paints have been supplying Rye DIY with decorating materials for decades, so we know there is demand. and it was apparent there was also a lot of demand for such a shop in Rye, and clearly it was very well regarded. The clincher was discovering that Joel and Rick, two key members of staff with over 25 years of experience between them, were keen to keep the shop going, hence you can still find them there. After a lot of hard work we are now open for business, and keen to hear your thoughts if there’s anything you think we should stock or do that we’re not currently doing. Thank you for the very warm welcome Rye. The unit, on the lively Cinque Ports Street, is actually made up of two shops. Thus there is plenty of space for the great selection you’d expect from a branch of Trade Paints, as well as those handy things you’d expect from a DIY store (logs, key cutting, electrical, plumbing, ironmongery, bulbs to name a few). As with any of our branches, those with an account will have full access to it, including any special terms that may be present. For those reading this who are not familiar with us, please come in and give us a go – we are confident you won’t be disappointed. The plan is very much to combine the knowledge we have of the decorating world with the more diverse selection one would expect from a traditional DIY store. In the event that we don’t have what you’re after, you have our word we will do all in our power to get it, ideally the next day! Again, as with any of our branches, there is free tea and coffee for customers, free wet paint signs and free delivery. We can mix Farrow & Ball equivalents in all manner of economical and robust paints. There is also the impressive range from Mylands available. It is with great pleasure, and more than a whiff of excitement, that we can announce branch number six is now open for business. So good to have a DIY shop open again in Rye.